The only memory I have with Cannelloni was the bland and overcooked version from certain hospital cafeteria. Trust me, after one too many fake curries, chewy meat dishes and greasy fried rice there (I didn’t always bring my own lunch) your mind would strangely point you to somewhat ‘safe’ options of vegetarian pasta. Big mistake. Nearly scarred me for life. Anyway, back in those days my meals were usually inhaled. There’s this thing about eating for doctors. The pager will inevitably go off few bites into your meal…..
Why am I talking about this? I guess I’m just trying to prove a point that bad cannelloni brings me unpleasant flashbacks. Nevermind that. Today, this version is entirely different. Glorious. Flavorful. Enough to erase the intruding memories. Enough to prompt a moment of silence when you devour the tubes of delight. Did I really say the tubes of delight? Sorry about that. I’ll be serious now. I wouldn’t go as far to say that this is a low fat meal. But it contains less cheese than the usual version. I’ve omitted the Béchamel sauce and sprinkled some grated cheese directly on top instead. I’ve also halved the amount of ricotta cheese in the filling and increase the amount of spinach. You could definitely use fresh spinach. I’ve used frozen ones because I have them in my freezer and I’ve used the fresh ones up in my green smoothies. I’ve also spiced it up by adding plenty of cayenne pepper. That’s optional, of course. To make the napoli sauce, heat 2 tablespoon of olive oil in a heavy pan. In low heat, add the garlic and slowly cook and let the flavour infuse into the oil, careful not to brown the garlic. Add onions and cook til soften. Pour the diced tomatoes in with tomato paste. Add oregano flakes and season with a little bit of salt. Cook until the tomatoes starts to break down. If it gets too dry, add some water. Sprinkle cayenne pepper while turning off heat. Preheat oven to 180°C. Ladle half the napoli sauce in a lasagna dish (long retangle one), spreading evenly over base. Place Ricotta, Feta, spinach, garlic, parsley, basil, Parmesan, salt and pepper, nutmeg, lemon juice, and cayenne in a large bowl. Mix to combine. Cut each lasagne sheet in half crossway. Place 1/2 cup of ricotta mixture along length of each lasagna sheet and roll up to form a tube. The mixture should make 6-8 tubes depending how full you like them filled. I’ve made 6 to cut the carbs a little. Lay tubes side by side in the dish. Ladle the rest of the napoli sauce over to coat. 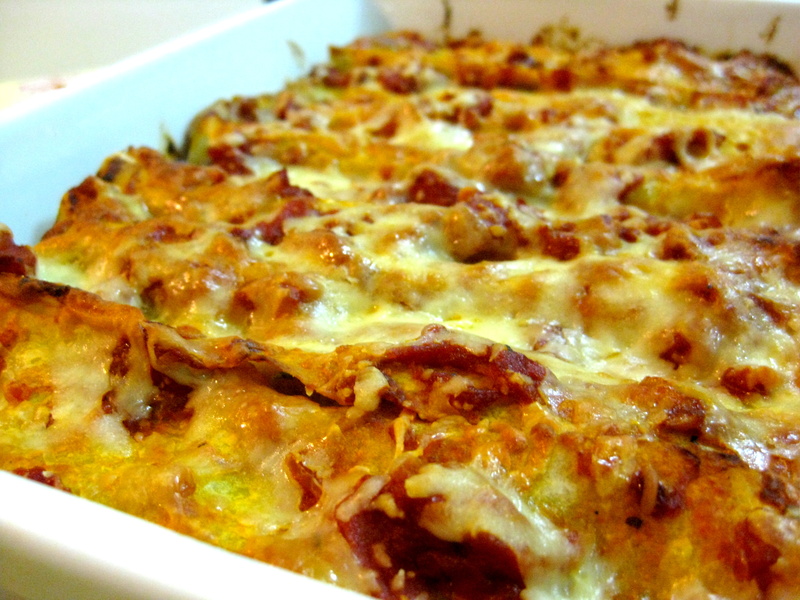 Sprinkle with cheeses and bake for 30 minutes or until golden. The cannelloni could be a bit fiddly to serve so make sure you use 2 spatulas to support them. Perhaps a little more work involved, but perfect for weekends. A little indulgence from time to time won’t hurt. 🙂 Oh I just love the way Italians eat. Delicious. Just sad it didn’t last a week or something. 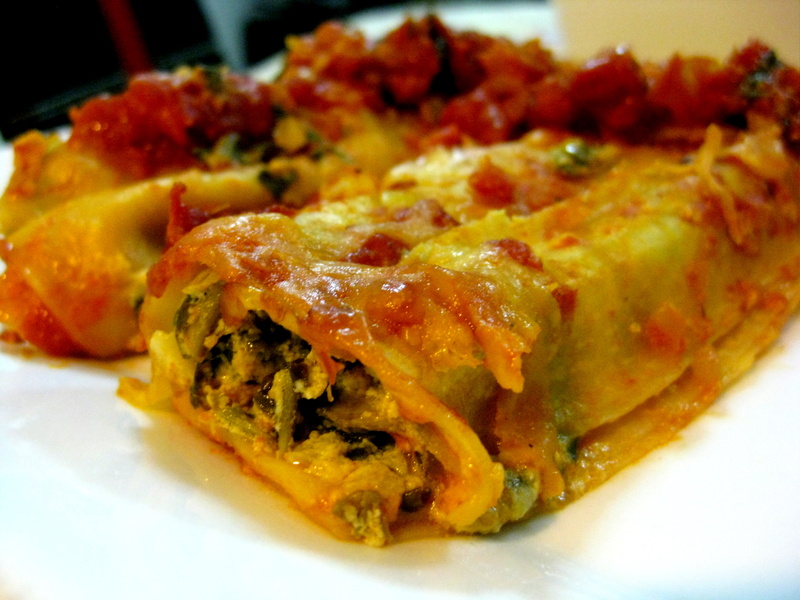 I’ve never made cannelloni before, maybe I should give it a go. Try it! Love the combination of spinach and ricotta or feta.